Since RL Nat's were run as a Thursday to Saturday event Sunday was free of racing for us. 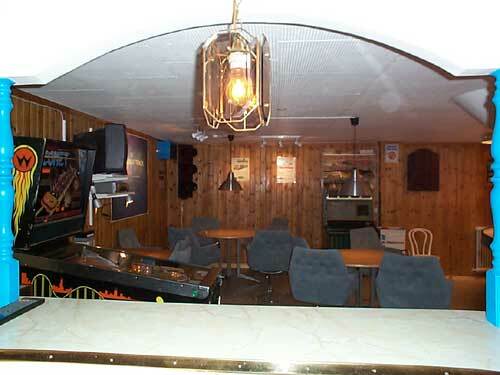 Photo taken from our kitchen/bar over our café. The Finns stayed in Mönsterås until Sunday morning and then left of to Stockholm and the ferries. 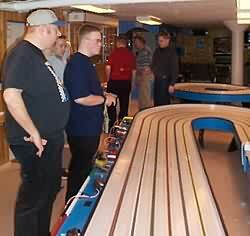 Mats Hummel invited them to visit our raceway at SSC (Stockholm Slotcar Club) and since we had a TV-set there and Formula 1 was on they accepted gladly. We all came to the track just in time for the start so we all wondered why David Couldthard was not on pole. Mika Häkkinen was able to follow Schumacher on the first lap and it came into a rather boring event waiting for the pit stops. Meantime the Finns strolled around and looked at our place and to drive it we turned the power on and put some rentalcars on the track. 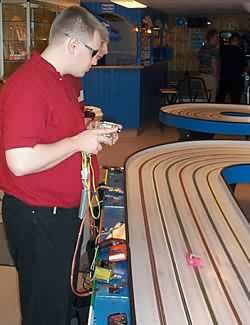 Soon all lanes were occupied so we started up our good old trusted Swedaxi and drove some 1-minute races. 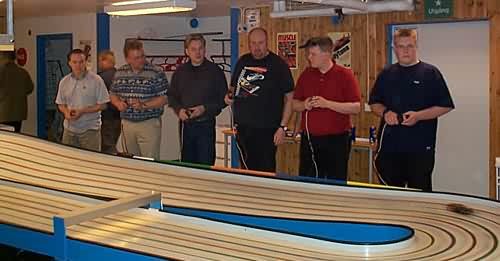 Jari, Juha, Marko, Andy, Kimmo and Esa-Pekka. 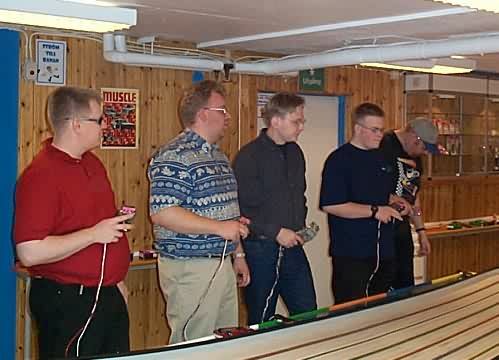 Kimmo, Juha, Marko, Esa-Pekka and Andy. After some rental car driving I gave them the opportunity to try a G-7 wingcar (with a lot of choke on Flexi car glue). They all drove a few laps and then handed the controller over to the next guy. Andy surprised us all of being so fast right away. Left:Esa-Pekka driving, Andy standing in-line. Right: Kimmo trying my Saloon car. A Volvo.